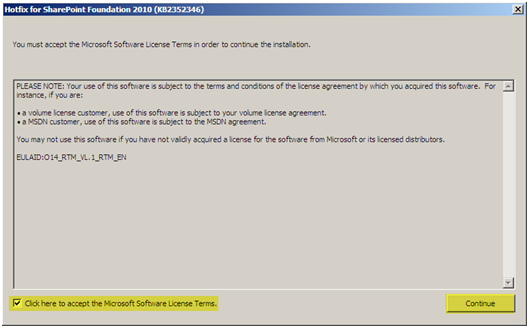 The Office 2010 Cumulative Update for August 2010 (KB 2396341) contains additional hotfixes that apply to Project Server 2010 and FAST Search Server 2010 for SharePoint. 3. 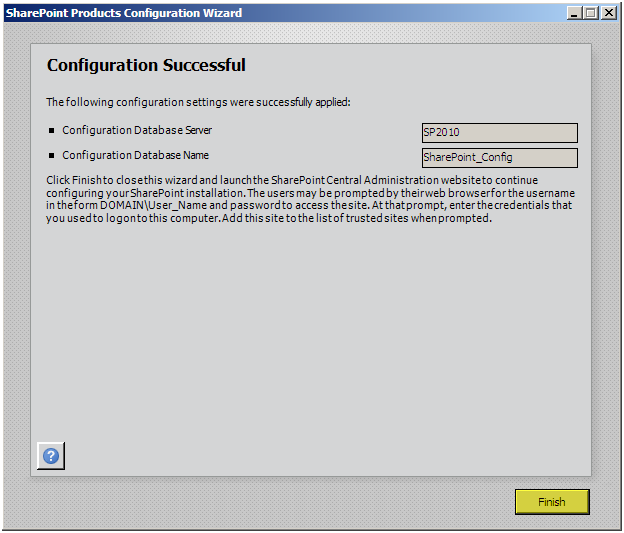 Run the SharePoint the “SharePoint Products Configuration Wizard” from ONE server only AFTER both updates has been installed on ALL SharePoint servers. Run the “spf-kb2352346-fullfile-x64-glb.exe” on all servers in your SharePoint 2010 farm. 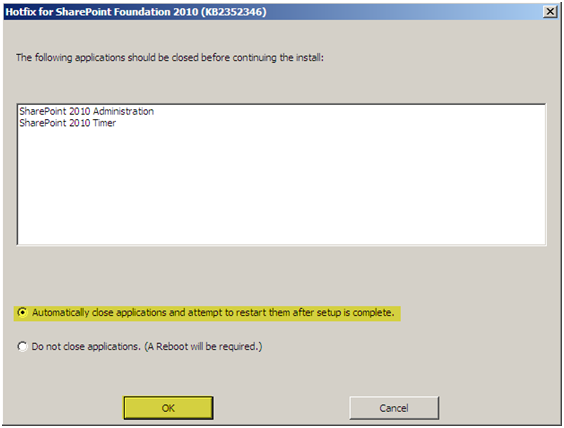 Let one complete before you install it on another box in the farm. 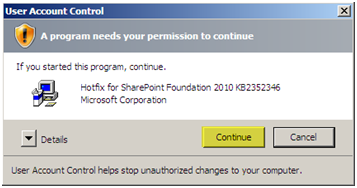 UAC should be disabled on all of your SharePoint Servers. 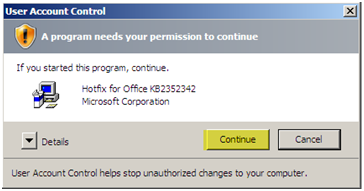 If you have it enabled you will get this prompt. 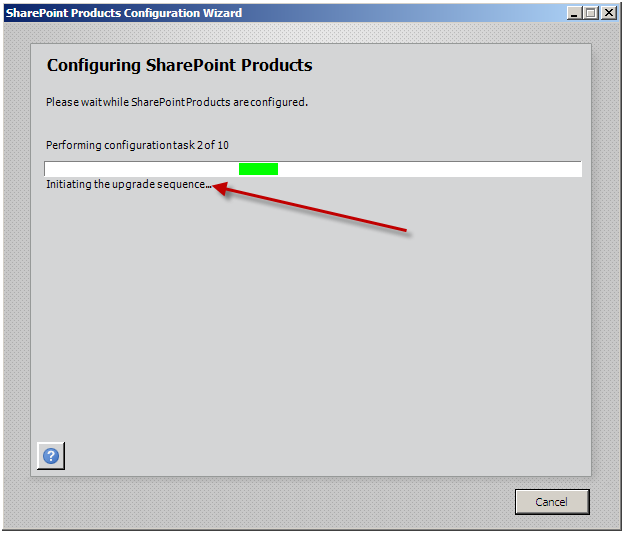 Run this install on ALL other SharePoint 2010 boxes at this point before installing the next update! 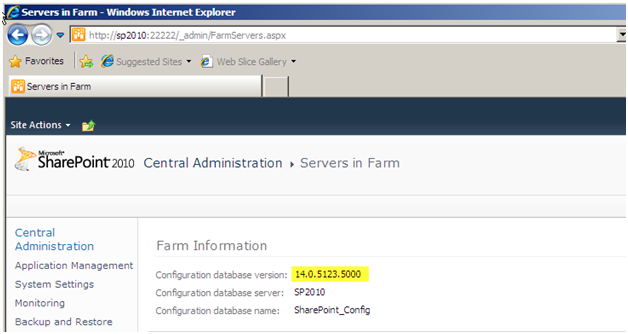 Run “office-kb2352342-fullfile-x64-glb.exe” on all servers in your SharePoint 2010 farm. Let one complete before you install it on another box in the farm. 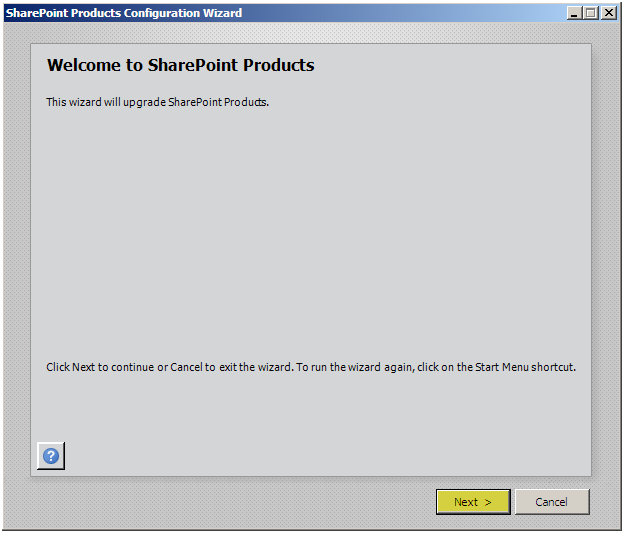 Run this install on ALL other SharePoint 2010 boxes at this point before running the SharePoint 2010 Products Configuration Wizard! 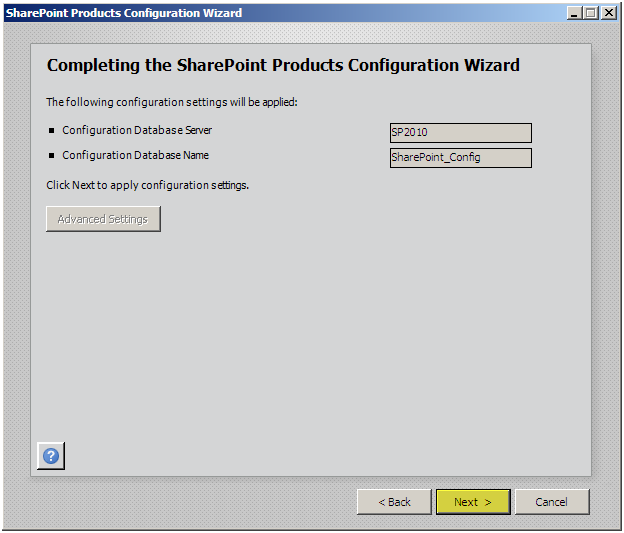 After both updates are installed on ALL SharePoint 2010 Servers in your farm, you will need to run the SharePoint 2010 Products Configuration Wizard from ONLY ONE server and you will need to run it only ONE time. 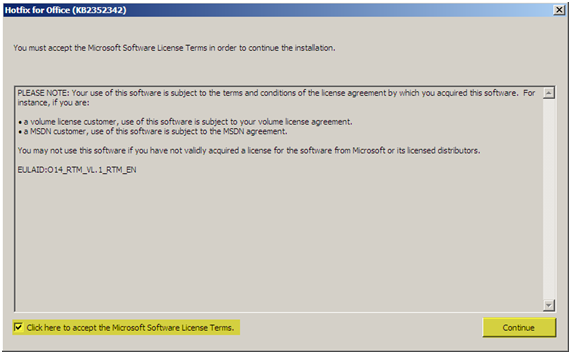 The old version was 14.0.4762.1000 and the new version after the upgrade is 14.0.5123.5000, cool beans – we’re done. 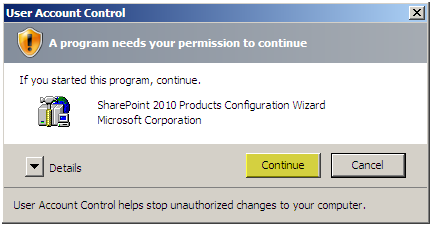 This entry was posted on Wednesday, October 20th, 2010 at 11:16 am and is filed under SharePoint 2010. You can follow any responses to this entry through the RSS 2.0 feed. You can leave a response, or trackback from your own site. I think you'll find that you need to run psconfig/psconfigui on all of the servers in the farm. 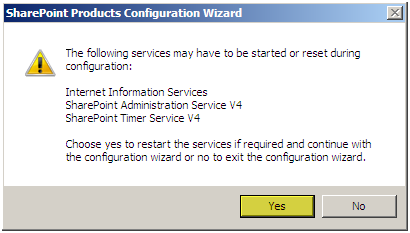 After applying the August CU, I found that I was getting a health alert, pointing out that I needed to run psconfig/psconfigui on my 2nd server. 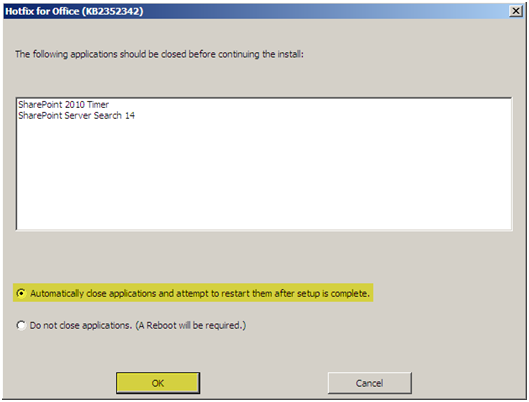 This is also the case when you install WebApps.